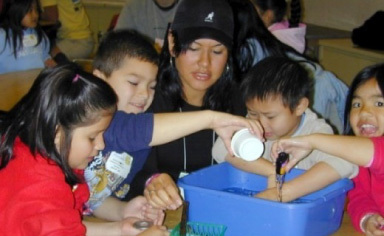 Dr. Adina Paytan has been involved with COSEE California (COSEE CA) for several years, and has played a key role in the development of two of the Center's major contributions, the Communicating Ocean Sciences (COS) course, and the Ocean Literacy campaign. Adina's involvement began when she was initiating a range of science education programs and came across the COSEE CA website. "They were very responsive, and since then it's been an ongoing exchange," says Adina. "Right after that first call I participated in a COS workshop, then started teaching the class, and since then it became a natural symbosis, and a productive one." Adina uses the COS program to train grad students and then place them in a classroom setting, such as at the Westlake School in Santa Cruz, where they work with elementary school students. "The benefits are huge, "says Westlake Principal Clyde Curley. "We will have a whole generation of kids who have had opportunities to see themselves as scientists, and think as scientists." The elementary students also get exposed to the scientific process and the possibilities of grad school, and grad students get exposed to engaging their content with a non-scientific audience. Adina also uses the COS course to train her grad students to work as mentors to high school students, through the NSF-funded program Youth and the Ocean "She brings strength in both research and education and outreach," says COSEE CA co-PI Catherine Halversen. "I’m not sure we would have gotten anywhere [with COS] without her." The Ocean Literacy campaign is a nationwide effort to develop consensus about what every student in the United States should know about the ocean. "We could not come to consensus without the input of scientists working in field," says COSEE CA PI Craig Strang. "Adina has been a key player in the process from the very beginning. And there is still a lot of work to do."